Craft Snark: Hamster or Second Sled Dog? Hamster or Second Sled Dog? I was chatting online with a friend, and mentioned to her that I was feeling like a hamster on a wheel. I've got tons and tons of projects going on right now... but most of them are future things that I can't post, lots that I can't even Instagram. Because they're for contests or magazines. So they have to stay all G-14 Classified. Some of them are for future series, and I'm trying to get them done so I don't have to stress at the last minute. So I'm working like an even crazier than normal lady, but don't have a lot that I can show for it. Like a hamster on a wheel... I'm running, but the view isn't changing, and I'm getting off at the same point I got on. Which later led me to think about the expression about being the second dog on a sled team. You know, not the lead dog, but the dog right behind the lead dog. You're running, running, running (or is it mushing, mushing, mushing? ), and you're making progress... but the view doesn't change. In fact, the view for the second dog isn't so great at all. And that's where the question comes up. 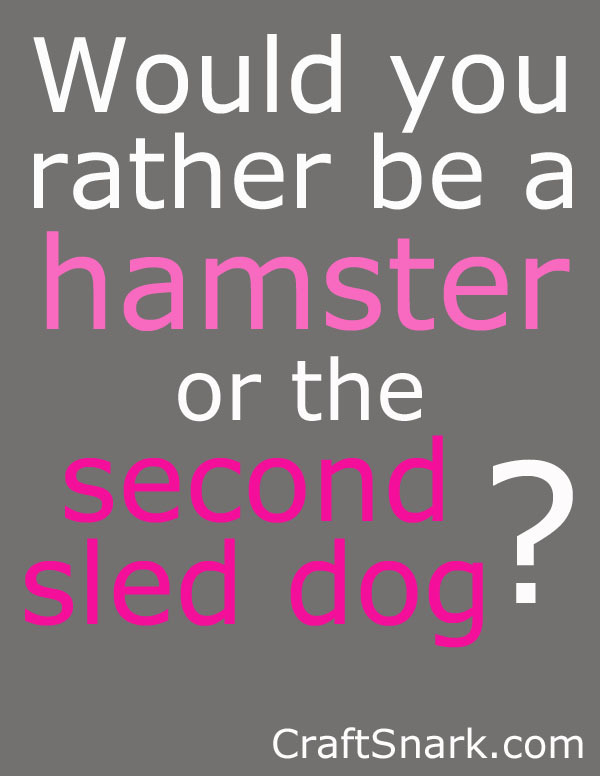 Would I rather be a hamster with a great view of some kid's messy room, running and making no progress... or the second dog on a sled team making huge strides while staring at someone else's behind the whole time? I'm thinking I'll pick option C, and just promote myself to first sled dog. Which means I need to get myself a set of directions. So maybe I'll be the hamster that bites my owner, gets dropped, and lives out my days fat and happy... until the family buys a cat. It seems there is no winning in the worlds of dogs and hamsters.